Baldini Plumbing & H.V.A.C., LLC is a full service plumbing, heating and cooling business located in Groveland, Ma. Our services include furnace, boilers, and water heater installations. We also repair and service natural gas furnaces, gas fittings, tankless water heaters, and central air conditioning systems. Other services include kitchen and bath remodels, plus all plumbing repairs and installations. This includes garbage disposals, whole house filters, sinks, faucet, toilets to name a few. We offer 24 hour emergency service. You will receive our own one year labor warranty and you won’t have to call an 800 number if anything goes wrong with the fixtures or equipment we install. We use only performance-proven plumbing products and we back our product manufacturer warranties 100%. Rest assured knowing we will do your job correctly and in detail. We are fully insured and in compliance with all municipal codes and the highest industry standards. All jobs have the owners oversight to ensure that your job is of high quality. I’ll only work with the best materials available and provide a 1 year guarantee on all labor. I never compromise quality for time and give my clients realistic schedules that accommodate their lives. I strive for honest customer service, so contracts are broken into three 1/3 payments with the final payment due when the finished work is to your complete satisfaction. Born and raised and still a resident of Groveland. Have built up this plumbing, heating and cooling company to serve the community I live in. We are thankful for the all the people who continue to recommend our business, and we hope to provide our services for many years to come. From high efficiency gas and oil condensing boilers and direct hot water and tankless water heating systems. Viessmann boilers can provide your home with a wide range of high quality, German-engineered heating solutions that have low energy consumption, and will keep your family warm and comfortable all year long. For almost 100 years, Viessmann has refused to settle for anything less than excellence. Their heating products are made from highest grade materials, designed with the latest technology, simple to service and are built to last. Vitodens 100-W - The perfect mix of performance, quality and value. These high efficiency units take up a minimal amount of space, and provide an excellent source of hot water and heat. 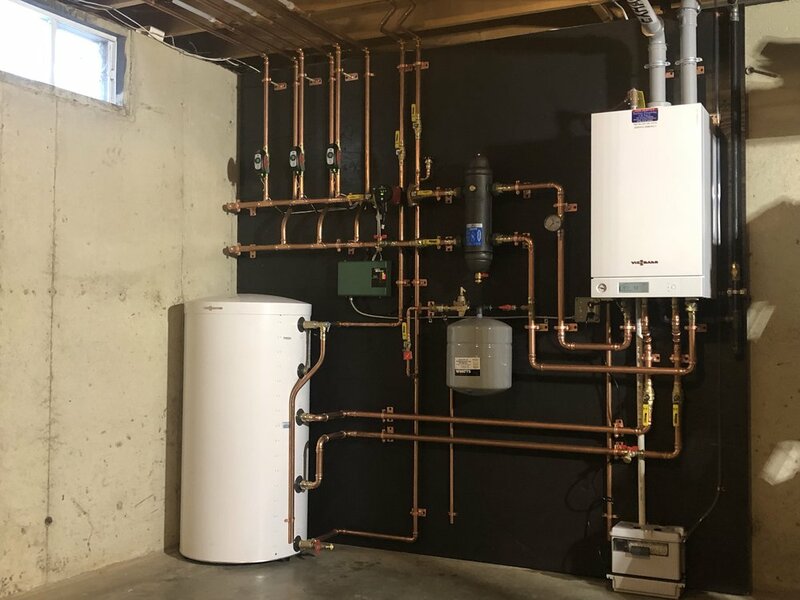 The new Viessmann 222-F gas-fired condensing boiler is an ideal space-saving option for new installations and a smart upgrade for outdated boiler and domestic hot water (DHW) storage systems. Its compact, floor standing design offers an economical space heating and DHW solution for homes with moderate heating loads. At the core of the new Vitodens 200, B2HA and B2HB are the Viessmann stainless steel Inox-Radial heat exchanger and MatriX cylinder burner. Together, they allow the greatest amount of heat extraction to be achieved with minimal loss.